We are implementing a set of balance changes today. 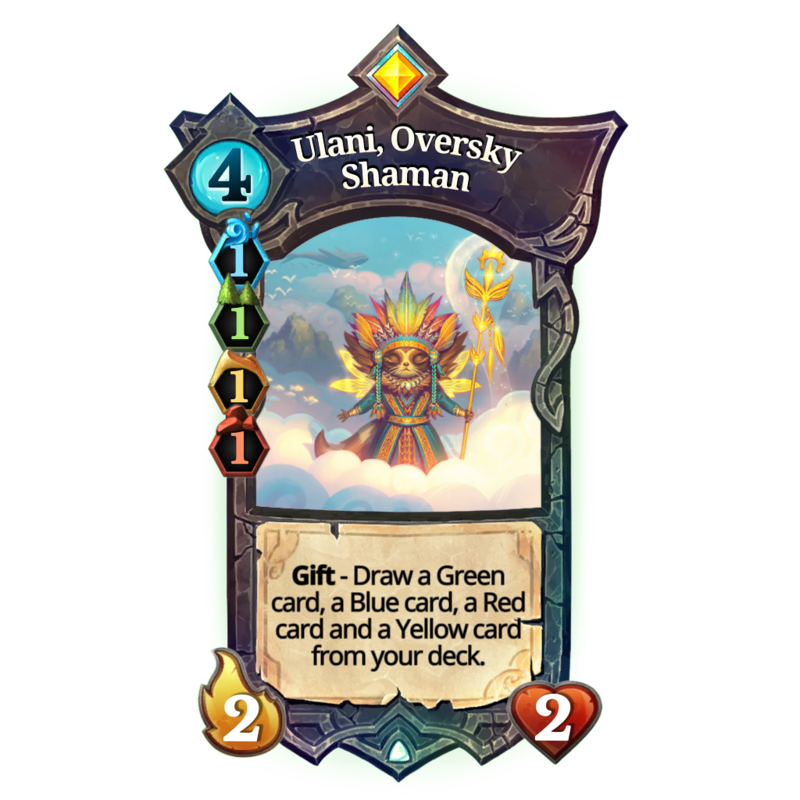 We'd also like to officially share the Oversky cards that were revealed during the Monthly Cup last Saturday and explain a little more about the new incoming Wild mechanic. 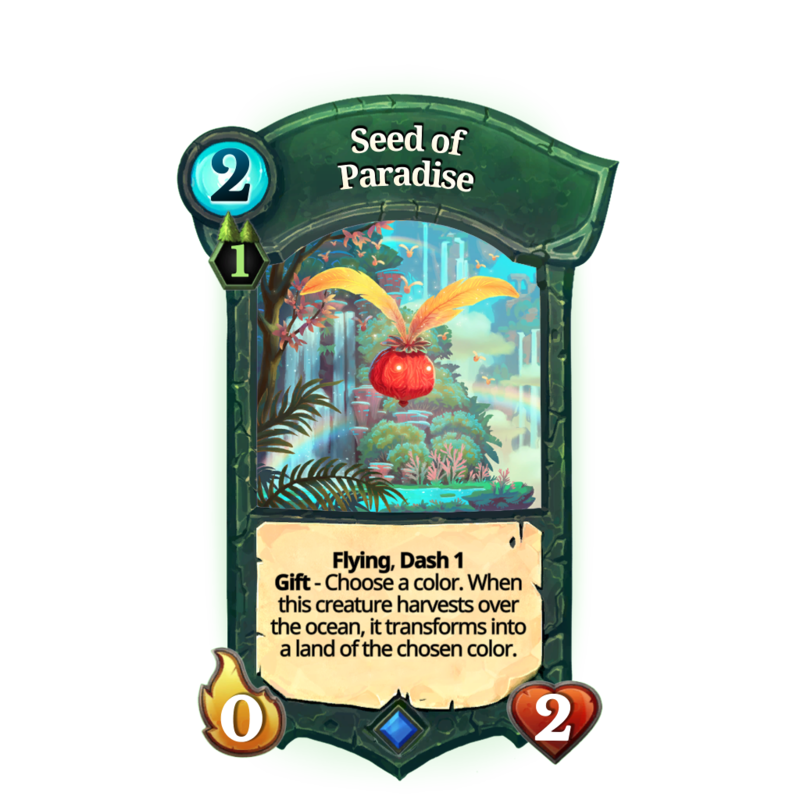 While we believe the state of balance in Faeria is in a relatively good spot, as evidenced by a diverse set of decks being seen in the past three Monthly Cups and the meta of the ladder shifting slightly week to week, we do recognize that there are a few specific cards that can be adjusted in order to limit the occurrence of punishing early-game swings. Community feedback along with our own observations has led us to decide to make sweeping changes to our "Star Legend" characters, as well as a few movement tricks that often make an appearance in early turns that can sometimes snowball out of control. In addition to this, we include a couple more experimental changes that can potentially open new deck-building options. While we'd like to maintain the high power level and flavor of our Star Legends, we aim to limit the instances where an appearance of one of these powerhouses in the early turns can create overly appropriate swings in tempo or board control. An increase land requirement of one should provide an extra turn for opponents to develop a wider array of answers before one of these legends begin to surface. Mountain cost increased from 2 to 3. Desert cost increased from 2 to 3. Forest cost increased from 2 to 3. Faeria cost reduced from 6 to 5. Ruunin will follow suit in order to keep our Star Legends' land requirements uniform, but will be given a discount in Faeria. Ruunin does not tend to suffer from the issues of the other legends, and we'd like to see her continue to be a viable card in some decks. Is now 4/2, up from 3/1. Can now only move the land it is summoned on. While Prophet of Tides receives a more robust redesign, we only deepen the color requirement of Grovecaller. 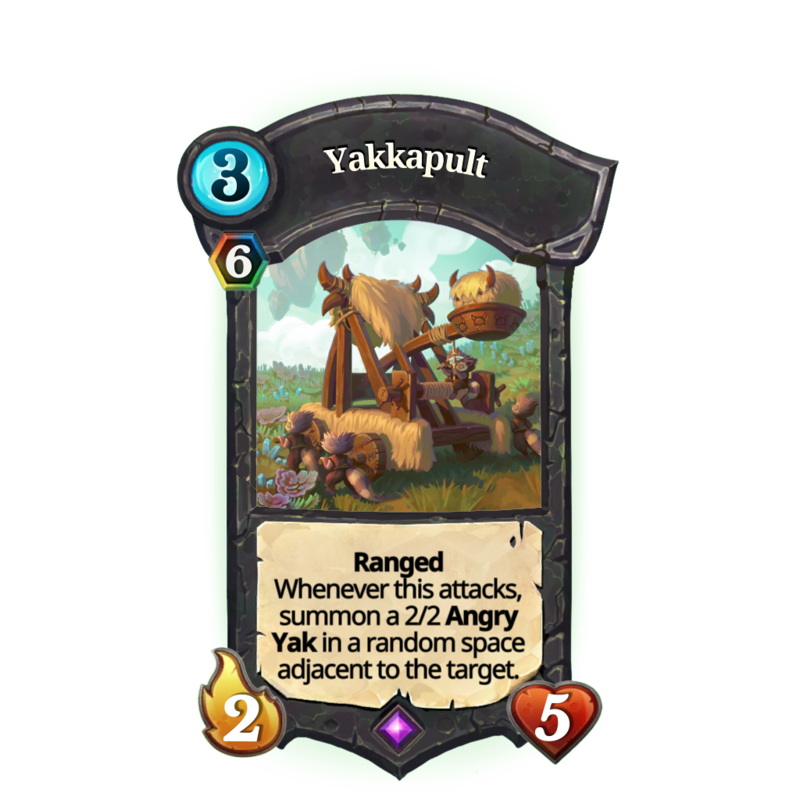 These two cards are being adjusted for many of the reasons mentioned above regarding early-game pressure and seemingly unpreventable swings in tempo. Now 7/6, up from 6/6. Desert cost reduced from 4 to 2. Now 0/5, up from 0/4. While Crumbling Golem has made only a recent appearance in ladder meta, we'd like to open the door for its inclusion in the Angry Red archetype which has fallen out of favor for quite some time. The nature of Crumbling Golem's design allows for counterplay with a wide variety of cards, and generally discourages such a creature from being used in control decks. We want to see if this will allow a push for a stronger Red archetype to emerge that can allow certain Rush decks to have a higher representation in the meta in general. Shaytan Monstrosity is another card that we've had a lot of time to analyze after its most recent change, and we're confident that it's safe to push this card into a much higher power level. We believe the gameplay that Monstrosity provides is generally exciting and satisfying, and want more players to be able to experiment with decks that are constructed around taking advantage of this unique card. Needless to say, with every balance change we monitor the results very closely and will make any adjustments as necessary in the future. We also recognize there are a lot of balance suggestions from our community that may be seemingly ignored in this patch. While we cannot address every single one of these concerns, we appreciate your feedback and do earnestly take it into consideration with every wave of changes we make. In the case of this patch, our focus is mostly on the early game and how we can alleviate some of the heavy pressures felt before players are sometimes unable to develop an appropriate answer. The Oversky will introduce a new type of land requirement: Wild. Wild land requirements can be satisfied by possessing any one of the four existing special lands: Mountain, Lake, Desert, or Forest. 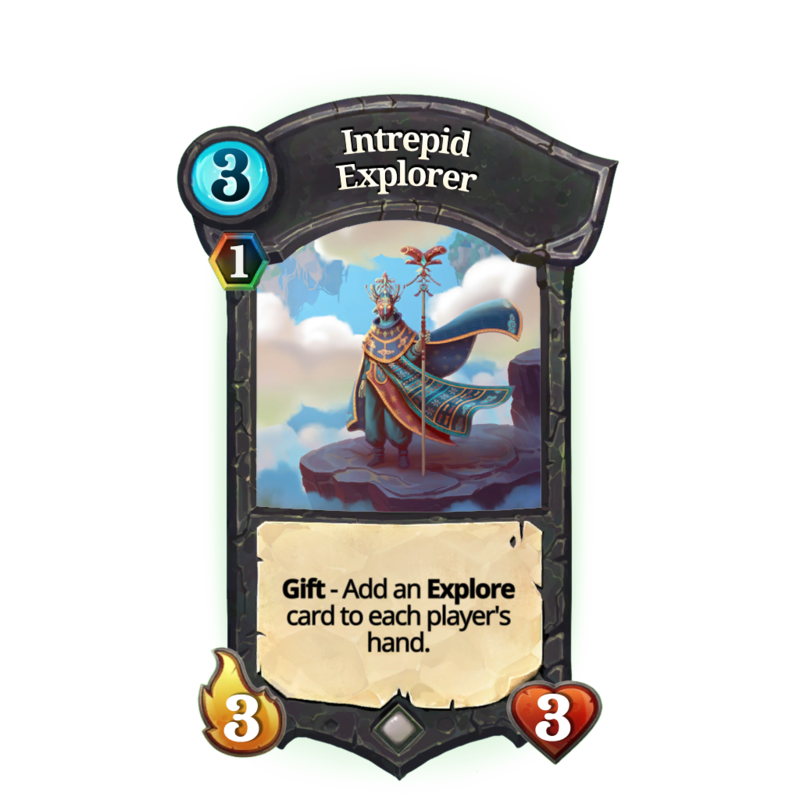 Intrepid Explorer and Yakkapult are two examples of cards that feature Wild land requirements. 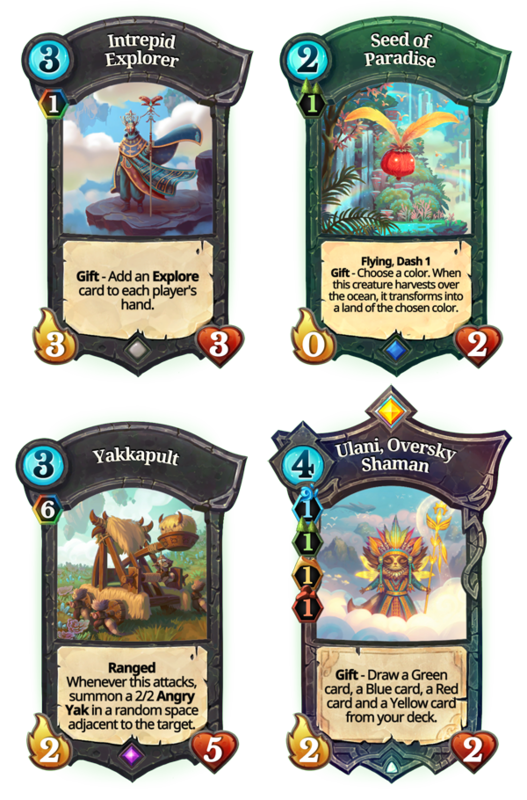 Our aim in adding Wild lands to Faeria is to promote and encourage new styles of multi-color deck building never before possible. "If a card costs one Forest and one Wild land, will having one Forest satisfy both requirements?" - No. Wild land requirements will be in addition to any other special land requirement a card might have. In this case, you would need one Forest and one of any other special land (the additional special land could be a second Forest). "Do creatures that require only Wild lands need to be summoned on a special land?" - No. Wild land costs do not influence casting zones for creatures. "Does Punishment deal 5 damage to creatures that only cost Wild lands?" - Yes. Creatures that only cost Wild lands are considered Neutral. For this same reason, Wild land cards would not be drawn by cards that generate cards of any specific color, such as Spellwhirl. This, of course, is the number one question players tend to ask about this summer's expansion. While we're not ready to reveal an exact date at this time, know that we're working very hard at getting it ready as soon as possible and will be sure to let you know a date when we're sure it's ready. As a repeat of the disclaimer from this weekend, the cards we've revealed above are still subject to ongoing internal testing and may reach live servers with slight tweaks if deemed necessary. In the meantime, expect a few more teasers headed your way to wet your appetite.